Elsie Mae Trammell, 91, former Duncan, Oklahoma resident passed away Saturday, January 19, 2019. She will be greatly missed by her family and friends. Funeral services will be held at 1:00pm Saturday, January 26 at the Freedom Biker Church, Duncan, with Rev. Billy Paul Morgan, Rev. Mike Covington and Rev. Kenton Daugherty officiating. Interment will follow at Duncan Cemetery. Services are under the direction of Don Grantham Funeral Home, Duncan. The family will receive friends at the funeral home Friday, January 25 from 5:00 to 7:00pm. Elsie Mae Davean Gray was born on December 31, 1927 to David Robert Gray and Eilean Elsie Green Gray in Duncan, Oklahoma. Elsie Mae attended Irving and Emerson Elementary schools; going on to Junior High. She graduated from Duncan Senior High in May of 1946. After which, she attended and graduated from Duncan Business College. Shortly after finishing business college she was hired by Halliburton Oil Well Cementing Company and worked there from August 1947 until August 1958. During this time, she was attending the First Church of the Nazarene where she met the love of her life, Mordell Trammell. They were married January 29th 1948 and had three children; Lonnie David, Sara Renee, and Alma Davean. Through the years, she has been very active with the churches she has attended. For over 60 years she was the Sunday School Secretary. She also served as Secretary for the Bible Missionary Church Board. For a few years she was also the treasurer for this same church as well as the Duncan Christian School. She has been fondly remembered by many as the teacher of the Juniors’ class at Bible Missionary Church. Elsie Mae was also very active in her community. She was the President as well as holding other offices in the American Legion Dobbs-Adams post 55 Auxiliary of Duncan. She was the first woman President of the Optimist Breakfast Club, as well as a founding member of the Genealogical Society of Stephen’s County. Here she served on the board and worked as a volunteer. She was able to do much of her family research and help others in their endeavors. Elsie Mae loved reading her Bible. She also enjoyed doing family research and was an avid reader. Additionally, she enjoyed sewing doll clothes for her granddaughters’ dolls. She was also a collector of various dolls. Mordell and Elsie Mae moved to Shawnee, Oklahoma in the fall of 2012 to live with their daughter, Davean and her husband, Carl. She enjoyed making new friends at The Twin Lakes Nazarene Church as well as the McLoud Senior Citizens Center. She was preceded in death by her parents; and her son, Lonnie David. 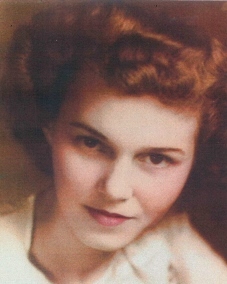 She is survived by her husband, Mordell Trammell, two daughters and their spouses, Sara Mayes (Mike), Davean Scoggins (Carl); four grandchildren (and their companions), Charmin Andrews (David), Anthony Morton (Angela), Palladin Scoggins and Grayson Scoggins (Allyson); also 15 great grandchildren; and 4 great-great grandchildren; and other loving family members.